This one-of-a-kind artifact is part of the HMS Associates Archives. This item was purchased several years ago from the previous owner of this now defunct company. In order to appreciate the importance of this pre-production piece of toy history, a little background on the company that produced them is necessary. HMS Associates, founded in the late 1940's by three partners, was based in Willow Grove Pennsylvania. The company specialized in product development, taking their client's abstract ideas and converting them into "patterns", prototypes that could then be sent to tool companies who would copy them and make metal production molds. In 1952 one of HMS's partners, Raymond Haines solicited Abe Shikes, president of Aurora Plastics Corp., convincing him of the huge potential market for plastic model kits, which was expanding greatly at that time. Thus, an almost two decade long relationship was born in which HMS provided Aurora with prototypes for virtually all of their models, as well as slot car bodies. In addition to Aurora, HMS performed services for a number of other well-known toy/hobby companies, including MPC, Ideal, Hasbro, Galoob, Kohner, and Remco. In 1994 the company was dissolved and all of it's assets sold, with the exception of the archives. The last owner (who purchased the company in 1989) was savvy enough to save most of this wonderful material from being discarded. After many years of negotiations, I was most fortunate enough to be able to obtain the entire remaining contents of the archives. 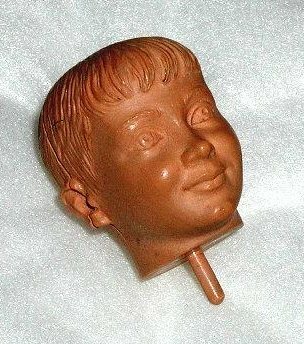 Here is an entirely hand-carved acetate plastic master pattern head of Billy Mumy for Aurora's mythical unproduced Lost In Space diorama kit featuring Will Robinson and Dr. Smith. It should've been made! Carved by the master sculptor Bill Lemon. This two-piece pattern is mint with no damage whatsoever. Incredible detail! This is an unprecedented opportunity to acquire absolutely unique pieces of baby boomer toy history.